Waterbury, Connecticut’s fifth largest city, faces challenges common to smaller post-industrial cities across the country, but has made several important strides over the past two decades to reframe what an such a place has to offer, including restoration of the Palace Theater, introduction of the Arts Magnet School, and relocation of the Waterbury branch of the University of Connecticut. As a result of these investments, recent introduction of bus rapid transit service to Hartford, and forthcoming railroad service improvements to Stamford and New York Today, the city is poised take the next steps in its continued resurgence as part of Connecticut’s constellation of dynamic urban centers. 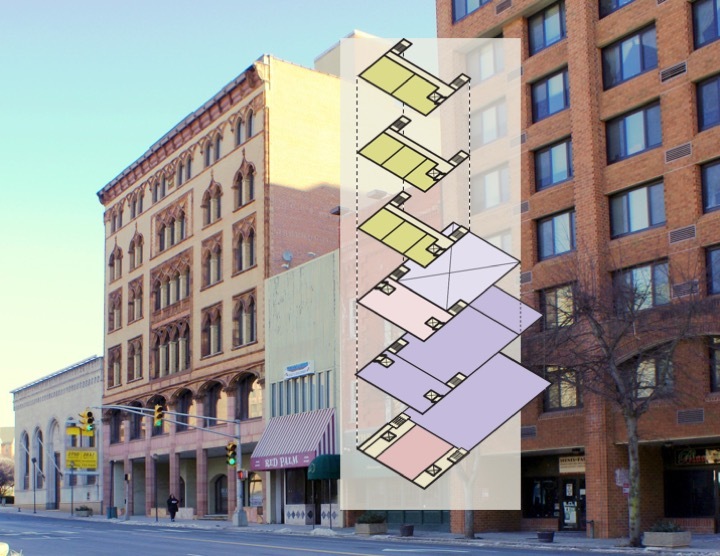 Waterbury Next is a proposal to tip the downtown real estate market by leveraging past and ongoing investments, bringing jobs to the core of the city, adding market rate housing, and enlivening the public spaces in between. The project components are interconnected, not co-dependent, but mutually reinforcing. They include the strategic redevelopment of currently vacant linchpin buildings, in concert with improvements to the public realm that will add value to these properties and the rest of the downtown. The plan identifies four key downtown properties, redevelopment of which would have independent utility and help improve the health of the overall downtown real estate market. For each property, the plan developed a conceptual program based on market opportunites, architectural layout, operating pro forma, total project cost, necessary subsidy, and resulting economic output, jobs created, and local/state taxes generated. Transit Operations, Amenities, & Routing Improvements. Downtown Waterbury is served well by transit today, which provides access to and from points beyond. However, downtown property owners and visitors to the Green are often frustrated by some unintended consequences of the downtown transit operation around the Green. The City’s central civic space can feel overwhelmed by this singular purpose of transit, undermining its potential to be a great gathering space that adds value to all the property around it. This condition is largely an externality of a downtown transit operation accommodating city-wide and regional needs. One solution proposed in many cities is to create a “transit center” somewhere outside of the core. Unfortunately, this approach is often very expensive, only shifts the problem somewhere else, and frequently makes taking the bus downtown an inconvenient passenger experience. Instead, Waterbury Next proposes developing a downtown routing plan that serves the green and the center of the city with minimal bus idling time, and helps attract new riders by being more comfortable to use and more easy to understand. This routing plan would be set the downtown priorities and design, be incorporated into a forthcoming city-wide transit plan by the regional Council of Governments, and be complimented by building new transit shelters at the hub of the regional system - iconic but maintainable - that better serve existing passengers, and provide amenity to attract new riders, who might otherwise choose to drive. Brownfield Acquisition and Remediation to Prepare for Riverfront Greenway & Redevelopment. Departure of previous industries left brownfields on the banks of the Naugatuck River, exacerbating the challenges faced by nearby neighborhoods. Today, Waterbury is planning to reclaim the river by building a regional, multi-use greenway and preparing for the redevelopment of industrial properties along its edge. Anamet is chief among these opportunities, and its redevelopment is critical to reactivating the riverfront. Waterbury Next proposes acquisition of the property to allow the City of Waterbury to access a grant for environmental remediation of the property - the first step to its full redevelopment. After the site is acquired, environmental issues are remediated, the City will be more prepared to implement the Naugatuck River Greenway. A variety of re-use options can then be pursued on the property, ranging from repopulation with a manufacturing use to the development of a new urban neighborhood along the riverfront. Setting up interim agricultural and pop up market uses on the site may be an option keep it active and prevent blighting influences, which may otherwise occur. Placemaking Connections at the Waterbury Green. Waterbury is fortunate to have a central civic space like the Green and a tight network of streets that connect it to the rest of the downtown. However, like many other cities, the streets around the Green insufficiently prioritize the pedestrian, and as suggested by a recent concept plan for the space, the Green does not meet its potential as a gathering space. In order to improve downtown hospitality, implementation of this proposal would enhance existing performance space at the Green without undermining its historic qualities, make substantial efforts in traffic calming on the streets surrounding the Green itself (in concert with improved downtown transit routing) to make the city center more pedestrian-oriented, and make strategic streetscape improvements to streets intersecting with the Green to expand its impact and reinforce the walkability of the downtown. JVM Studio's Jonas Maciunas, as a senior planner at RBA/NV5, prepared the plan as a easy-to-read policy proposal with Mark Keener and 4Ward Planning, including budgets for all component projects. Together, they joined the mayor of Waterbury at the state capitol to present Waterbury Next to the governor's staff and request the State's participation in implementing the plan.